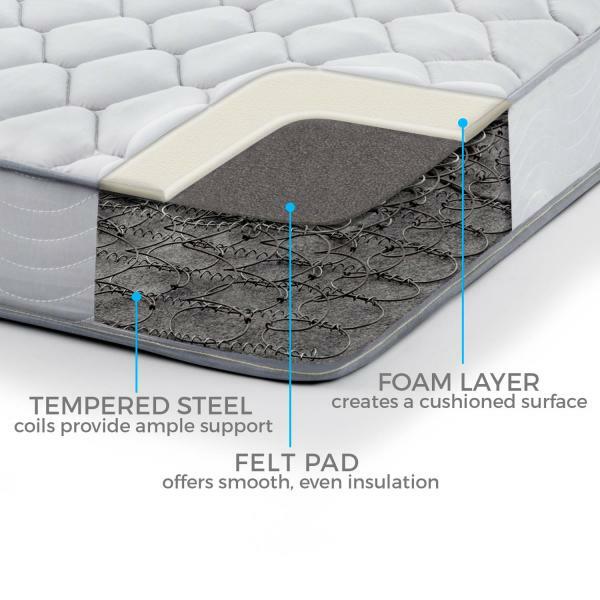 Mattresses designed with steel coils in their underlying support layer are the best option for those people seeking a traditional feel, but they can also offer a "hybrid" of time-tested support features with modern comfort materials. Are Innerspring Mattresses Better than Foam? Innerspring mattress have been around the longest, but that does not mean they are a poor choice. The quality of mattress coils, framing materials, and comfort layers has improved to such a degree that a quality innerspring mattress can be just as supportive and durable as a foam mattress, in some cases more so. Innerspring mattresses are a particularly good choice for heavier sleepers and stomach sleepers, who might compress an all-foam mattress too much for it to be supportive in the long term. Springs have been used in mattresses since the 1800s, and even today, 75% of mattresses still include at least some springs. The simplest (and least expensive) mattresses are made almost entirely of springs, with a thin layer of foam or padding on the top and/or bottom. 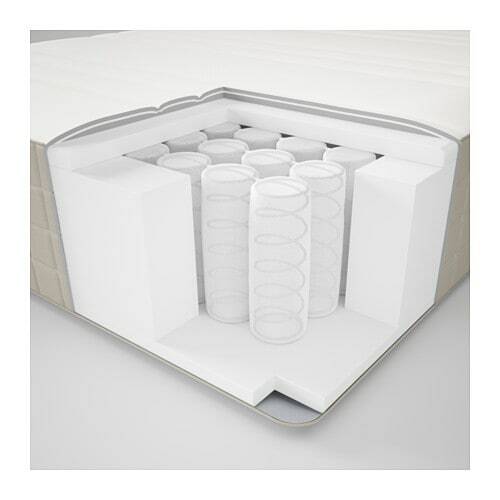 Higher end and more modern models like the Saatva and WinkBed mattresses use pocketed coils to improve motion isolation, along with multiple layers of coils for both support ad comfort. Other innovations include zoned support, where coils in different parts of the bed provide softer or firmer support by varying the type of wire, size, and number of turns of the coil. An advantage to mattresses made mostly of springs is good airflow. Many people also like that innerspring mattresses have some bounce (compared to all-foam or latex mattresses that hardly bounce at all). What's the Difference Between Innerspring and Pocket Coil Mattresses? There are two main types of coils in mattresses. Connected coils are what you probably remember, where the inside of the bed is a mass of steel coils connected to each other on the sides, or an even older style where the springs are one continuous wire. A newer type of coil bed uses pocketed coils. Here, each coil is encased in its own fabric sleeve. This allows each coil to move independently, and since springs never touch each other, eliminates the chance of bed squeaks and creaks. Another difference is that pocket coil mattresses are usually better in terms of motion transfer. Connected Coils: The mattress you had as a child was probably an innerspring mattress with connected coils. Connected coils are made in a few ways, but in each case, springs are connected to the springs next to them. (Check out our Coil Guide if you want the nitty gritty on how connected coil mattresses are made.) A key advantage is durability, since weight is distributed across the whole bed. A disadvantage can be noise, since there's the potential for metal to rub on metal, creating the signature mattress 'squeak.' And connected coil innerspring mattresses aren't the best in terms of motion transfer, since compressing one spring affects all the nearby springs, making it more likely a partner will feel your movements. Below is an example of a traditional innerspring mattress with connected coils. Pocketed coils. A newer type of innerspring mattress employs pocketed coils. This type isolates each spring in its own fabric pocket, which minimizes motion transfer and noise since each coil compresses independently. A potential downside could be durability, since the 'work' is not shared by nearby springs as in a connected coil innerspring bed. Here's an example of an innerspring mattress using pocketed coils. You can see the majority of the mattress is still coils, with a thin layer of foam on top. If you like the traditional feel and proven durability of innerspring mattresses, and want to learn more, we delve deeper into the factors and features that impact your decision. Learn about the many components of mattress padding that determine a bed's comfort level, including memory foam, pillow-tops, Euro-tops, quilting, tufting, and ticking. Discover the important differences among mattress coils, and learn how they vary in support and durability, including wire gauge, coil count, number of turns, and more. Find out how foundations, such as box springs, torsion modules, and low-profile foundations, can affect the support and durability of your bed. Increasingly common are hybrid mattress, which use a support layer of coils, topped by layers of other comfort materials such as memory foam, latex, wool batting, or standard foam. Most often, hybrid mattresses use pocketed coils, which improve motion transfer and eliminate noise since the springs do not touch each other. 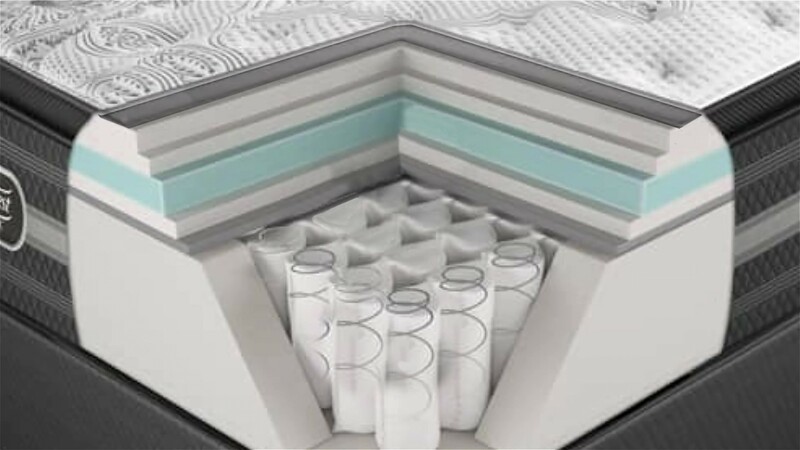 Below is a cutaway of the Beautyrest Calista Black mattress, an example of a hybrid mattress with pocketed coils forming the support layer, and several layers of other comfort materials on top. There are a large number of hybrid mattresses on the market, many of which have been reviewed by GoodBed, including the Avocado Green mattress, which uses natural latex over pocketed coils. The Nest Alexander Hybrid employs gel memory foam over pocketed coils. The WinkBed uses two layers of pocketed coils under gel foam. The ultra-luxury Hästens 2000T mattress uses natural wool fleece and layers of horsehair atop pocketed coils. These are just some examples of how companies are using traditional coils on the bottom with more modern comfort materials on top. Head to our Hybrid Mattress Buyer's Guide for more on this type of mattress, which combines tradition with modern materials.